* 2. Preheat the oven to 350F. * 3. In a medium bowl, whisk together the flour, baking powder and salt. * 4. In a large bowl, beat the butter and sugar with an electric mixer until light and fluffy. Beat in egg and vanilla. On low speed, gradually add the flour mixture. * 5. Put the pistachios in a shallow bowl. 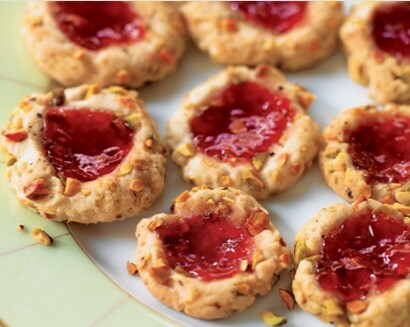 Shape heaping teaspoons of the dough into 1-inch balls and roll in pistachios, pressing to coat. Place about 2 inches apart on ungreased baking sheets. With your thumb, make a deep impression in the center of each cookie. Spoon teaspoon Crimson POM Jelly into each hollow. * 6. Bake for 10 to 15 minutes or until golden brown around the edges. Cool cookies on cookie sheets for 3 minutes and then transfer to a wire rack. 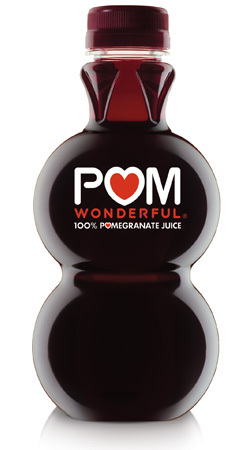 And just a little tip for POM lovers: I can’t really have caffeine after a certain hour (like 3pm – yes, I’m an 80 year old woman) – so when I want a good night’s sleep I just mix some POM juice with seltzer and lime for a tasty drink. Thought I’d throw the recipe out there in case you are rowing in the same boat as I am when it comes to issues with caffeine.